This is maybe one of the stories from the Greek and Roman mythology (it is told by Ovid in his Metamorphoses.) that has more strongly influenced the universal literature. And this is what inspired William Shakespeare to write his Romeo And Juliet. 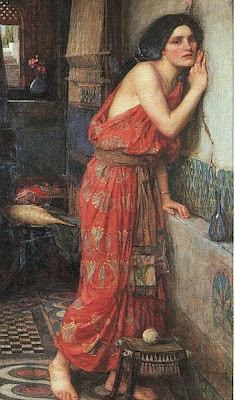 Thisbe was one of the most beautiful women that lived in Babylon. Beside her house lived an attractive boy called Pyramus. They were deeply in love, but their families hated each other, so their parents were opposed to that relationship. But the bigger that this opposition was, the bigger the love between the couple grew. Both Thisbe and Pyramus tried endlessly to convince their families but they refused to accept this relationship. In despair because they couldn't marry, they fled one night. Their plan was to get away from Babylon, and they agreed to meet in the mausoleum of Nino, near a mulberry tree. Thisbe arrived first, hiding her face with a veil. She sat under the mulberry tree, waiting Pyramus. In the mausoleum of Nino there was a fountain, and a lioness approached to drink. She had her face covered with blood, as she had just devoured two oxen. 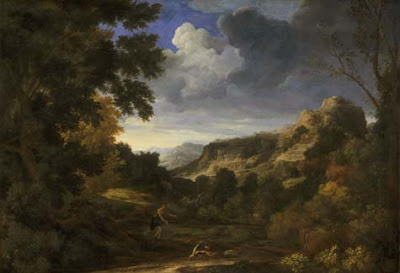 When Thisbe saw the lioness, she felt frightened and fled away to a nearby cave. Due to her hurry, she did not notice that her veil fell to the ground. The lioness found the veil. Her fangs were still with blood, and tore the veil, that laid on the ground ripped and dirty with blood. When Pyramus arrived to the mausoleum, he saw the footprints of the lioness. He searched for Thisbe desperately, but he didn't find her. What he found was the veil of Thisbe, torn and covered with blood. Then Pyramus imagined the worst. Feeling broke by this pain, thinking that Thisbe was devoured by the lioness, he fell on his knees under the mulberry tree, crying of sadness. His pain was so deep that he couldn't stand it, and killed himself with his own sword. At the moment, Thisbe noticed this terrible confusion, and filled with pain and tears, said to the corpse of Pyramus: "Oh, my love, you couldn't survive to my death, and I can't survive to yours. I'll never abandon you, and no one will never separate us. Our parents will have to bury our bodies in the same sepulcher". After this, she put the sword aiming to her heart, and fell over it, dying side by side to her loved one. The mulberry tree turned red with the blood of the two lovers, darkened with that pain. And since that day, mulberries were black, with shades of red. Hi Emma, Happy valentine day, have a great this time with your family, friends who close to you and beloved peoples. Take a good care. I really enjoyed the story of Pyramus and Thisbe. It started out basically as two neighbors, who fell in love with each other by talking, but never interacting face to face because of the wall that separated their two families. We learned that sometimes they would communicate with sign language, but I don't know how they would have seen each other with the wall there. When they were more mature, they decided to run away from their families so that they could be together, so they snuck out past the guards and ran across the rooftops of houses to get to a clearing that they had previously set up. They planned on meeting under a mullberry tree, but Thisbe arrived first. When she got there, a lion came and scared her, so she ran into a cave to hide. The lion picked up her cloak that she had left behind and smeared it with blood, and when Pyramus came, he thought that Thisbe was killed by the lion. So, he stabbed himself in the groin and died from his wounds. Thisbe saw him dying, and she tried to revive him. 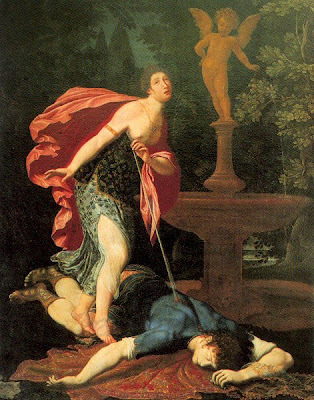 Apparantly, Pyramus opened his eyes when Thisbe said her own name, but he died immediately after. Then, Thisbe killed herself too, and the mullberry tree turned red to represent the blood of the lovers that had been spilled underneath it. I hope you all enjoy the story!